The obvious reason is bringing up our kids with a parent around. We have a fantastic preschool for our kids. But having a parent at home really affords us the opportunity to really instill our own values, not the school's. Adam goes to school everyday for kindergarten now, and Dova goes to preschool 2 days a week. When Adam gets home at 3pm he can get started on his homework right away with Dad's immediate help if he needs it. More Daddy time - I think the kids used to feel closer to mom. Now Doug finally an opportunity to get close to the kids. Still, I enjoy the feeling of not being able to peel them off of me when I get home. Morning routine simplified - I used to wake up at 6am, shower and dress, wake Adam at 6:30 am, have him dress (this would sometimes take the sleepyhead 20 minutes! ), get him breakfast, make 2 lunches, wake Dova up at 7am, get her dressed, get her breakfast, get the school stuff together, get everyone's coat on, pile into the car by 7:30 (OK, this was usually 7:45), drop them off at school, say a tearful goodbye to Dova, and get to work by 8:30am. Nowadays, I can leisurely wake up shortly after 7am, dress Dova if she is awake and get to work shortly after 8am, shaving an hour and a half off the old routine. Doug takes care of lunches and getting them to school at the leisurely time of 9am (OK, he may disagree about the leisurely part). Whew, what a life saver! Plus mom can just snuggle in the mornings instead of constantly cracking the whip. Better sleep for everyone - No more alarm clocks for this family!! I wake up naturally every morning and we no longer have to get the kids up early and allow them wake naturally as well. This makes them happier and much more helpful in the mornings (then again, I'll have to ask SAHD, he may have another opinion on the matter). Doug also gets to sleep in till 8am! Laundry - Doug is an excellent laundry robot. Now, there no more complaints about his wrinkly shirts and pants when I used do it (shh, they are still wrinkly, but he can't complain when he does it himself). He's been pretty good about catering to my laundry rules as well. Doctor and dentist visits - I used to miss work all the time for the endless doctor and dentist visits for the kids, plus all their sick days. Now Doug gets the pleasure of taking them to physicals, flu shots, lead tests, asthma checkups, dental cleaning and dental fillings. And since they spend less time at school, they've stayed healthier so there have been less sick visits and sick days as well. Resident car mechanic - Doug graciously fixes everything on all our cars, but now he has more time to do it instead of cramming it into precious family time on the weekends. Getting things done around the house - the honey-do list is long, but at least now there is a chance of things getting done. Being home for deliveries and service - no more waiting for deliveries or repair people to come between the ridiculous hours of 8-12 or 1-5pm. I could afford to do it when I used to work from home and it wasn't too bad being close to work, but this is much more convenient. Plus Doug really cracks the whip with repair people to make sure the job gets done right. Library - before this switch, the kids barely went to our local library. Now they are regulars and have a constant stream of new books and videos. Bonus item: Buying kid's shoes - I used to buy shoes at lunchtime and had the kids try them on when I got home. I usually had a good eye for what fits, but still ended up returning a few that didn't. Now, Doug can take the kid to the store, and have them try it on right there! What a novel concept. For whatever reason, it was too much to cram in on the weekends before. There you have it. I love you Doug and appreciate all that you do! There is no doubt about it....a parent at home is such a valuable thing for the kids. I sometimes wonder why some people have kids. The don't seem to take responsibility for them, and it often looks as though they don't understand their rolls as their teacher. IMHO, raising kids is the #1 priority of a couple once they choose to have kids. It's not quite like deciding to buy furniture....you take on the responsibility for another human. My wife Cheryl stayed home with our daughters, and we were also lucky enough to be able to swing that. No, our situation was not as novel as yours.....no role reversal, but I have to say that I totally appreciated what Cheryl did for our family....but then, she enjoyed it too and knew she was doing the right thing. I'm sure Doug is thrilled as well. 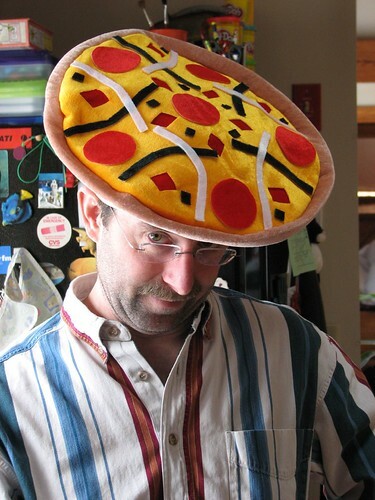 PS: Doug also looks good in thin-crust headwear.....I myself have been more of a "Stuffed Crust" guy myself. Howdy. I blog you over at Daddy Dialectic. This was an awesome post and really made me stop to appreciate that my own guy does for me and our family. Thanks for reminding me how great he is - I've linked you on my Monday Morning Munchies post today! I just found you from the blog party and had to see this post! My husband is also a stay at home daddy (former programmer!). We also are the same race make-up as you and your husband (although in reverse). Nice to meet you!